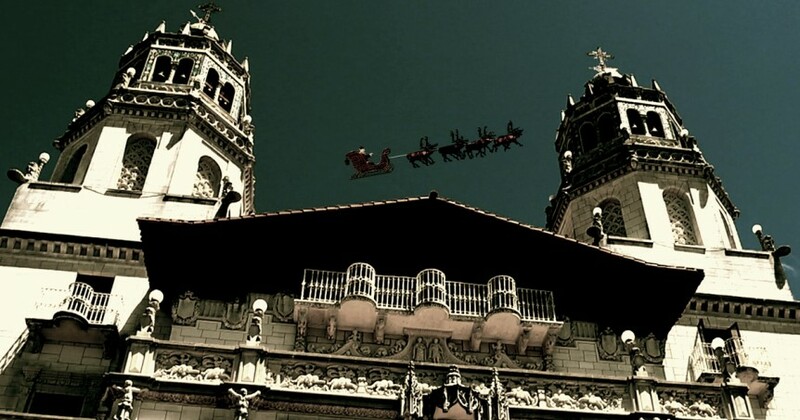 Santa Claus is spotted at in the beautiful coastal city of San Simeon at the historic Hearst Castle on top of the ‘Casa Grande’ before he takes a flight with his 8 merry reindeer. Do you see him? Hearst Castle was designed by architect Julia Morgan between 1919 and 1947 for newspaper magnate William Randolph Hearst, who died in 1951. Invitations to Hearst Castle were highly coveted during its heyday in the 1920s and 1930s. The Hollywood and political elite often visited, usually flying into the estate’s airfield or taking a private Hearst-owned train car from Los Angeles. Among Hearst’s A-list guests were Charlie Chaplin, Cary Grant, the Marx Brothers, Charles Lindbergh, Joan Crawford, Clark Gable, James Stewart, Bob Hope, Calvin Coolidge, Franklin Roosevelt, Dolores Del Rio, and Winston Churchill.